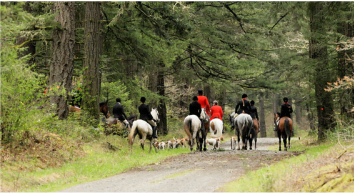 Little is know of the origination of the hunt, other than the information given in a newspaper article from the Tacoma Tribune in August of 1911 when the Seattle Hunt (now disbanded) came south to hunt with the newly formed Woodbrook Hunt Club. Woodbrook's benefactor was a local banker and his wife, Chester and Anna Thorne. Thorne was one of the founders of the Port of Tacoma, whose manse later became a favorite for movie sets and is situated on a road that still bears his name and is used to access the hunt. Following the acquisition of the land and the clubhouse by the US Government in 1938, the Club purchased five acres of land adjacent to the property which Major Mathews had purchased for his new riding academy. It was on this five acre parcel that the club constructed new kennels and runs for the hounds. A small cottage, which was included in the purchase, was first rented, and then later turned over to the kennelman for his living quarters. Major Mathews' riding academy was sold in the spring of 1940 to Mr. Arthur Hannum and Major and Mrs. Matthews returned to Victoria, B.C. to become active in war work. A Junior Hunt Club was organized in January 1941 and drag hunts were held for the young members every other Saturday on the odd hunt weekends. Following the war, the Club decided to resume drag hunting again under the new Master, Mrs. Joseph Gilpin. She resumed drag hunting that fall. The riding academy came under new management, having been acquired by Mr. and Mrs. Earl Craig. In 1946, the club began holding bi-weekly drag hunts. The annual horse shows were revived by the club to raise additional money for maintaining the hounds and kennels. However, these shows were discontinued in 1964 and Hunter Trials were substituted, being less work, but earning less money. A major achievement was securing recognition in 1962 by the Masters' of Foxhounds Association. Woodbrook enjoys a lively cross-section of age groups, from lifetime members and veteran riders, to proud parents leading their youngsters on ponies. First, second, and on High Holy Hunt days, third and fourth fields, are generally followed by a Hilltopper group. Members of the hunt, in this millennium, are not solely of the Tacoma area, as they were in the past, but of the entire Puget Sound region surrounding Seattle. Members live and drive from approximately two hours north of the kennels and to an hour and a half south and southwest. It's a long commute for many of our members, but worth the trip since participation is at an all time high. Many hunts in our country face the challenge of shrinking territory. For Woodbrook, the dilemma is a bit different since the hunt territory is secured by a military reservation. A major highway threatens to cut the hunt's access to that reservation. Should the highway become a reality, the club will need to purchase land to the south of its present location in order to maintain access. The cost of such a move, facilities needed and reasonable commuting time for members are all under consideration at present. The book not only covers the history of the club from its beginnings but goes all the way back to the introduction of horses to the area by natives. Packed with photos, the book shows the buildings where today’s club started, the various names it used from the beginning and the community leaders who were principals in the club. Author Joy Keniston-Longrie, a recreational rider and graduate of the University of Washington, is the great-granddaughter of Clay Lincoln Keniston, who arrived in Tacoma in 1884 as a blacksmith. Keniston-Longrie combined her passion for history and recreational riding to create this pictorial equestrian history of the prairies in Lakewood, south of Tacoma. 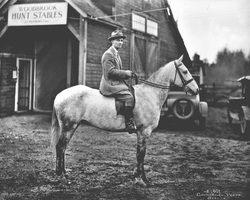 Photographs for this book were contributed from a variety of collections, including the Tacoma Public Library, the Washington State Historical Society, the Museum of History and Industry, the Woodbrook Hunt Club, Horseland/Starfire Farms, the Brookwood Equestrian Center, and the private collections of local residents. Go to the Contact Page of our website an let us know if you would like an autographed copy of Joy's book.